How to format IMpb or GS1 Human Readable in Excel to Mail Merge using Barcode Fonts? 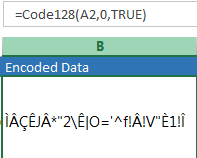 This is what I receive when I use the Code 128 Font Package with the IDAutomationVBA font encoder. I need to remove the highlighted part of the human readable and also need the human readable separated. How can I do this? By the way, the barcode scans fine. The data in parentheses, 420 and 92, are Application Identifiers that require an FNC1. The data also requires a MOD10 check digit. 1. View the IDAutomationVBA installation post until Step 8 is completed. Adjust the amount of characters to remove to account for spaces. 5. Merge into the desired application and apply the IDAutomationC128M (IDAutomationSC128M - demo font) to the Encoded Data field. 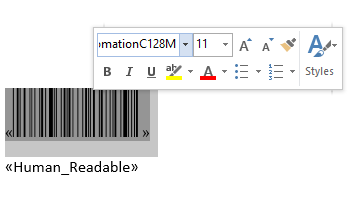 Place the Human Readable field either above or below the barcode.